Here is your January 2019, Dunbar Harbour Trust Newsletter. Sparkling Dunbar ... a generous donation from Thelma! 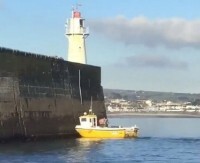 'Frozen' Fisherman rescued after five-mile ordeal. 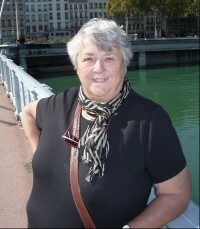 In 2012 Thelma Band had the idea of an event in the harbour-area focusing on families, local crafts and music. She got a positive response from her fellow directors of the Harbour Trust which set her on course to develop a format for Sparkling Dunbar. The first festival took place on Saturday 2nd June 2012. The festival was well-supported by locals and visitors and was declared an outstanding success. The result was the repetition of the festival in the years that followed. The festival has grown over the years but still follows the same format. Financing of the event has always been tight but support from local businesses has allowed it to continue on a non-profit basis. In order to assist with the finance and help ensure that the festival remains in the Trust's calendar, the estate of Thelma Band has donated £6000 to the Trust. Rowing Club's Christmas Crew: rowing throughout the year, here photographed in the brilliant sunshine after partaking of (a little) mulled wine and mince pies. 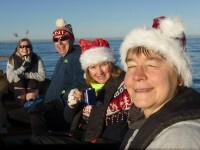 A different crew were out on New Year's Day just before the Loony Dook. The Club expects to compete in the Skiffieworlds 2019 in Stranraer, July 7--13th. 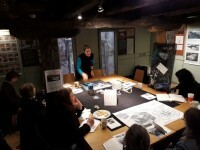 Julia held an information event at Dunbar Harbour on Tuesday 15th January in McArthur’s store meeting room; everyone was welcome. She plans to make her sculptures at the harbour, using discarded, washed up plastic drinks bottles and net-ends commonly found in the harbour and on local beaches. These sculptures highlight the plastic leaking into the sea and the value of this plastic that’s being wasted. A Chihuahua puppy died after being swept into Dunbar Harbour's chilly waters during strong winds at midday on Monday 7th Jan.
Local fishermen raised the alarm and alerted Dunbar’s lifeboat volunteers who raced to help the puppy's owner who had jumped into the harbour in an attempt to rescue his dog. The owner managed to swim to the other side and grabbed a ladder. Another RNLI crew member brought the puppy ashore but it did not recover. An ambulance transferred the man to hospital for treatment. The drama occurred as strong, gusting winds came across from Belhaven Bay. There were significant gusts caused by the winds twisting through the harbour mouth and rotating across the harbour. Dog owners have been urged by the RNLI to keep dogs on a lead when close to water and not to go after them if they get into difficulty. Move to a place the animal can reach safely and call. In most cases, the dog will probably get out by itself. If worried, call 999 or 112 and ask for the Coastguard. An RNLI spokesman said: "The crew's thoughts go to the dog's owner and family." A rare super, blood, wolf moon was clearly visible from Dunbar, and most of Eastern Scotland, despite some cloudy intervals. Conditions were almost perfect and early-risers appreciated this rare beauty! A quick-thinking fisherman who fell overboard managed to cling on to his nets for five miles and was dragged behind his boat back to shore. On Thursday December 27, Nathan Rogers was "amazingly" lucky to survive the ordeal, the RNLI said. He had been adjusting his nets when he fell in but the boat kept powering forward on autopilot until it crashed into Newlyn's South Pier. Penlee Lifeboat brought him in and he was treated for severe hypothermia. A young boy spotted the "very well known and popular fisherman" in the water and raised the alarm. When the lifeboat arrived Mr Rogers was being held up in the water by the skipper of another fishing boat. "He was very, very cold," he said, "We are just amazed he managed to hold on for so long." It is believed the boat was travelling at speeds of up to six knots (7mph). Mr Rogers has been recovering at home. 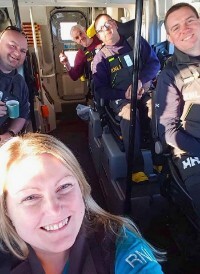 Dunbar lifeboat crew member, Laura, is undertaking a passage to RNLI HQ in Poole with Eyemouth Lifeboat‘s Trent class lifeboat, 14-11 Barclaycard Crusader, which is joining the RNLI’s relief fleet. We’ll miss Laura while she’s away but hope she has a safe passage and enjoys all the sights to see along the way. A Shannon class all-weather lifeboat replaces the current Trent class boat and is described as the "most agile and manoeuvrable" vessel in the RNLI's fleet. The Shannon can operate close to rocks and other vessels because she is propelled by waterjets instead of traditional propellers, making her well suited to the Borders coastline. We hope you have enjoyed reading our newsletter. ​Please contact us with your feedback and content for the website.